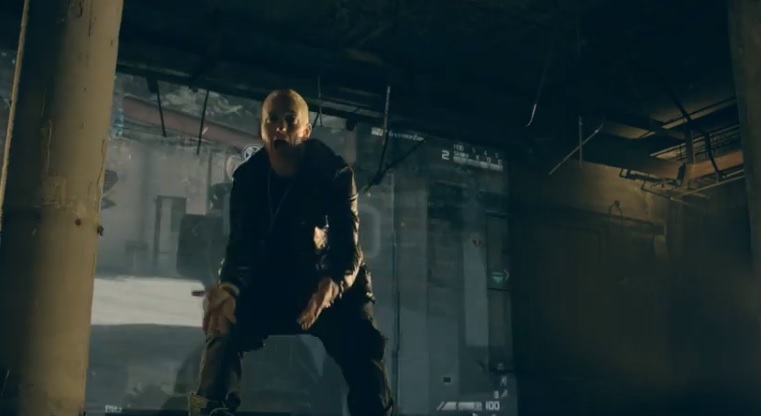 Eminem is back with a new music video for his Call Of Duty: Ghosts video game inspired track, “Survival.” Decked out in fatigues and performing in front of a giant screen showcasing fast action game play, Eminem the atmosphere raw and aggressive as he laces the rock infused track with lyrics detailing his early struggles in Hip Hop and overcoming the odds. Allegedly “Survival” also serves as the second single for Eminem’s upcoming The Marshall Mathers LP 2 album which is due out on November 5. This entry was posted in Music, Video and tagged call of duty, COD, eminem, ghosts, hip hop, Music Video, rap, survival, the marshall mathers LP 2. Bookmark the permalink.